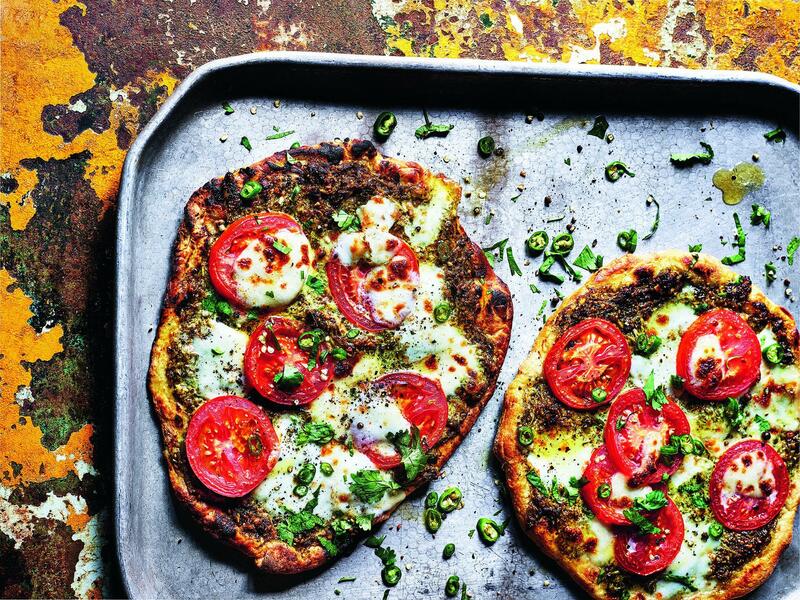 I’m a big fan of pesto pizzas and this coriander version is a real crowd-pleaser. You can easily double or triple the recipe. The pizzas cook quite quickly on the barbecue but you’re going to be busy. I can only fit one pizza on my kettle barbecue so I cook one, place it on the table and repeat. This easy recipe is great for hot summer weekends. All it needs is some good music and ice-cold beer – or whatever your poison happens to be – and you can fill your day, grazing with friends. Set up your barbecue for indirect heat cooking. I usually use about 3 shoeboxes full of charcoal. You need to get your barbecue as hot as possible. Meanwhile, to make the pesto, place the coriander, garlic, chillies, cashews, parmesan and oil in a blender and blend into a pesto. Season with salt to taste and set aside. Divide the dough into four balls and let rest, covered, for about 5 minutes. Lightly dust the surface with flour and then, using a rolling pin or your hands, roll or stretch the dough out thinly until you have four pizza bases around 25cm (10in) in diameter. I find it a lot easier to pre-cook my pizza bases in a pan, as with my stovetop garlic naans. Pre-cooking the crusts makes them easier to work with outside. Pizzas need a lot of heat, which is difficult to achieve on most kettle barbecues, so this headstart helps give them that delicious-looking char as if they came right out of a pizza oven. When your barbecue is flaming hot, spread the pesto equally over the pizza bases and top with the mozzarella and tomato slices. Place one or two of the pizzas on the cooler side of the grill and cover. Cook for about 5 minutes or until the cheese is soft and the crust nicely browned. Repeat to cook the remaining pizzas and serve hot. Make it vegan: you could leave the cheese off but there is good-quality vegan mozzarella on the market that melts well and is very convincing. Sift the flour, salt and baking powder into a large mixing bowl. Set aside. Bring 210ml (scant 1 cup) water to a rapid boil. Pour it into a jug and top with 210ml (scant 1 cup) cold water. This should be the perfect temperature to wake up the dried yeast. Stir in the yeast and sugar and leave to froth up for about 10 minutes. Most people love chocolate but it turns out no one does more than the Brits – with the average Brit found to have consumed 8.4 kg of chocolate in 2017, according to new data. Dr Becky Spelman, chief psychologist at Harley Street’s Private Therapy Clinic, is calling for Easter eggs to be banned for consumption for children under the age of four, claiming that giving them the opportunity to binge on chocolate so young will give them an unhealthy relationship with food later on. “This is a nightmare situation for parents of this generation as they have no idea how to teach their children to delay their response to cravings,” she said, explaining that too many young kids binge on these chocolates because their parents don’t know how to stop them. According to Tesco, pineapple has overtaken avocado as the UK’s fastest-selling fruit, with sales increasing by 15 per cent in 2017. In comparison, avocado sales rose by just under 10 per cent last year. Gluten-free breads, dairy-free milks and other plant-based products have been some of the most favoured foods in British supermarkets this year. Rather than the result of genetic modification, the avocados are formed by an unpollinated avocado blossom. The fruit develops without a seed which in turns stops the growth, creating a small, seedless fruit. The average bacterial reading of an office teabag was 3,785, in comparison to only 220 for a toilet seat. There is good news and a final hope for coffee addicts and lovers. You will now be able to drink coffee for longer as new study shows its can lead to a prolonged life. Scientists showed that those who drank between two and four cups of coffee a day had 18% lower risk of death compared to non-coffee drinkers. Coca-Cola is pulling the plug on its Coke Zero. The much loved drink will be replaced with a ‘new improved taste’. The move, backed with a £10 million campaign, is said to come from Coca-Cola supporting people to reduce their sugar intake. Coca-Cola want people make this move while not sacrificing sugary taste of Coca-Cola. The avocado craze has grown from hipster brunch restaurants to Starbucks. Starbucks have introduced their new avocado spread earlier this year and it has the internet in debate. Some argue that it not a spread but guacamole while others question if there is any avocado in there at all. When buying the new spread you can also buy an optional toasted bagel. It is a must try for all avocado connoisseurs. The iconic British chocolate bar is about to get its partner in crime. The new bar, named Goodness Knows, will replace the gooey caramel goodness of the mars bar with oats. It is said to be more like a Florentine biscuit with a thin dark chocolate bottom. While being moderately healthy Mars says that is has ‘good intentions’. One pack has 154 calories and will sell for about 90p. ‘Scottie’s Pizza Parlor’ in Portland Oregon has created the world’s cheesiest pizza using a total of 101 different cheese varieties. The company responsible for some of your favourite chocolate brands – think Cadbury, Milks, Prince and Oreo – have officially announced an opening to join their team as a professional chocolate taster. The successful candidate will help them to test, perfect and launch new products all over the world. For years, we’ve been told MSG (the sodium salt of glutamic acid) – often associated with cheap Chinese takeaways – is awful for our health and to be avoided at all costs. But one scientist argues it should be used as a “supersalt” and encourages adding it to food. Not only are lettuces becoming an increasingly rare commodity in supermarkets, but prices for the leafy vegetables seem to be rising too. According to the weekly report from the Government’s Department for Environment, Food and Rural Affairs, a pair of Little Gem lettuces had an average market price of £0.86 in the week that ended on Friday, up from an average of £0.56 in the previous week – that’s an almost 54 per cent increase. Kids celebrate Food School graduation with James Martin – a campaign launched by Asda to educate young people on where food comes from. When the yeast water is nice and bubbly, make a well in the flour mixture and pour it into the well. Mix it all together with your hands for a minute or so, then leave to rest for 2 minutes. Then knead the dough as best you can for about 5 minutes. It will be very sticky but don’t be tempted to add more flour. Form into a ball, cover and leave to rise for an hour in a warm place. When the dough has risen (it should double in size, but don’t worry if it doesn’t) divide it into six equal-sized pieces. Dust each with a little flour and form into smooth balls. Place on a high-sided tray and cover with a clean tea (dish) towel. Let the dough balls rise for another hour. Crispy fried spinach chaat is usually made with large palak leaves, which is a variety of spinach seen a lot in India that’s available at Asian shops in the UK. I usually use baby spinach leaves, which are easier to come by, but it takes more time to prepare because of all the chopping. I tried my first fried spinach chaat at a great little restaurant in London called Thali. The delicious chaat was one of their signature dishes so, understandably, they weren’t quite ready to give me their exact recipe. I have experimented a lot with this one and think I’ve got it pretty close to that chaat I enjoyed so much. Wash and dry your spinach leaves and remove the large stems. You will be shredding the majority of the leaves but hold about 8-10 large leaves back for dipping in batter. I find that it is quicker to stack the leaves to shred them. Shred the leaves finely. If you have ever tried fried seaweed at a Chinese, that is the look you are going for with this spinach. Heat about 10cm (4in) of rapeseed oil in a large pan or wok for deep-frying. When a piece of spinach instantly sizzles when added to the oil, you’re good to go. If you have an oil thermometer, aim for 200C (400F). It is a good idea to cook the spinach in batches. Fry each batch until the leaves become darker and are beginning to turn crispy, about 1-2 minutes. Transfer to paper towel to soak up any excess oil. The shredded spinach will become crispier as it dries out. To make the batter, whisk all of the batter ingredients in a bowl with just enough water to make a thick, smooth batter. Dip the large, whole leaves in the batter. It should coat them. If you find the batter is too runny, whisk in a little more gram flour. Fry the battered leaves in the hot oil until crispy and brown, about 1-2 minutes, then transfer to paper towel to soak up any excess oil. Season the shredded and battered spinach with salt to taste. To finish, place a big mound of shredded spinach on two plates. Top with the chopped onion and diced tomato followed by the battered spinach leaves, then garnish generously with the sauces. To serve, top with a couple handfuls of fine sev and a little more salt if you like. In a dry frying pan, roast the cumin seeds over medium-high heat until warm to the touch and fragrant but not yet smoking. Pour the roasted seeds into a blender or spice grinder with the mint, coriander, green chillies, garlic, ginger, lemon juice and 2 tablespoons of the yoghurt, if using. Blend to a paste. If you are having trouble getting the ingredients to blend, add a little more lemon juice or a drop or two of water until you have a thick green paste. You could now use the sauce to spread over sandwiches and wraps but if you are making chaats or like a smoother, thinner sauce, whisk the remaining yoghurt into the paste until very smooth. (You could even add more yoghurt if you prefer.) Season with salt to taste. I like to store this sauce for up to 3 days in restaurant-style squirt bottles for squeezing over lots of different dishes. Place all the ingredients in a mixing bowl and whisk until creamy smooth. Taste and add more salt or spices to your liking. Keep it in the fridge until required. Break the block of tamarind into about 6 pieces, put in a small saucepan and cover with 375ml (1.5 cups) water. Bring to a rolling simmer over medium-high heat, stirring often, for about 5 minutes, then remove from the heat and let it cool for another 5 minutes. Using a wooden spoon or potato masher, smash the tamarind in the water. The sauce will become thick, like ketchup. Run this through a sieve into a bowl, pushing against the solids with a spoon as you do. You should end up with a thick paste. This is like shop-bought tamarind concentrate but less concentrated. This one is juicy! It might have a lot of sauce but the corn koftas can stand up to it. You could use any veggie koftas. The most important thing is that you wrap it all up tightly so you don’t get it all on your lap! I should probably mention that when I made these corn koftas during the photoshoot for this book, they were a real hit! To make the koftas, boil your diced potato in water for about 10 minutes, until fork tender. Drain and mash. Pound the corn in a pestle and mortar into a paste. Mix the corn and mashed potato with the chilli powder, cumin, green chilli and coriander. Season with salt to taste and form the mixture into short sausage shapes or small ball shapes. Heat about 10cm (4in) oil in a wok or large pan to 170C (338F). If you don’t have an oil thermometer, drop a piece of the corn mixture in the oil. 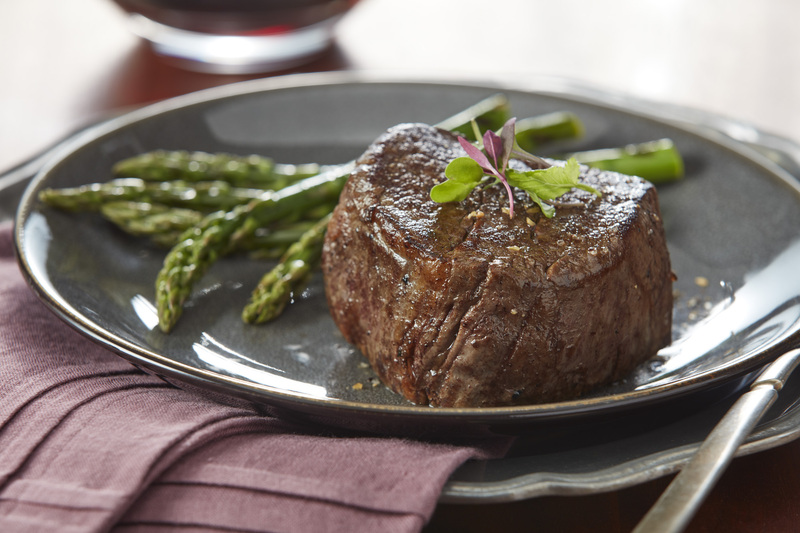 If it sizzles and rises to the top immediately, you’re ready to cook. When it reaches this heat, dust a kofta in the gram (chickpea) flour and place it in the oil. Repeat with the rest. (You may need to cook them in batches, depending on the size of your pan.) The koftas are ready once nicely browned and heated through, about 3 minutes. To finish, smother the tortillas with a good dose of yoghurt sauce and mint and coriander sauce and divide the koftas between them. If you like, you could also add some lettuce, sliced onions or whatever you want. Then wrap it all up to serve. Make it vegan: use vegan yoghurt alternatives in the sauce recipes.